We're off to see the Pure Amazing Wizard of Oz! 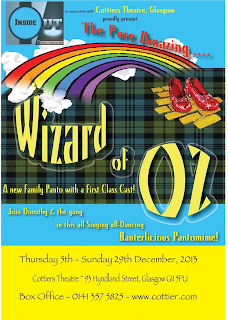 This Christmas, The Pure Amazing Wizard of Oz hits the Cottiers Theatre with a first class cast. Full of singing, dancing, hit songs and a banterlicious script. 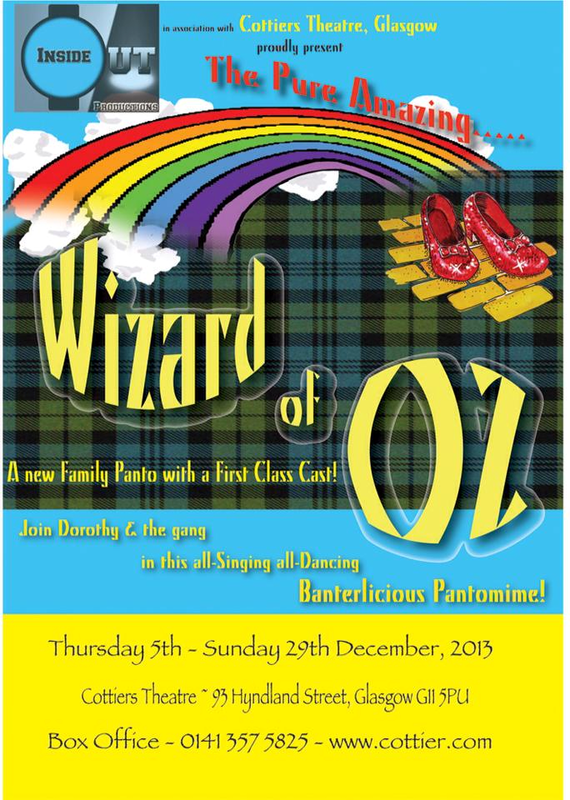 From 5th December and to 29th December you can join stars Neil McNulty (River City), Connor McAllister (Billy Elliott), Joanne McGuinness (Glasgow Girls), Lee Reynolds( Hair), Alison Rona Cleland (I Will Survive) to meet the Pure Amazing Wizard of Oz! Neil McNulty, known from River City fame commented,” I am so excited to be part of this panto. It is full of amazing songs and we are having so much fun. I am looking forward to seeing everyone there! I can’t wait to be the Scarecrow and be home in the West End for Christmas"
This year’s panto comes direct to the Cottiers from the producers of A Song and a Sip is resident monthly in London's West End. Other venues the show has toured to include; Tron Theatre, Glasgow and Byre Theatre, St Andrews. Other shows include I Will Survive, Company, Elegies and Broadway in the Bar. Connor, originally from the South Side of Glasgow, commented, "I am so excited to be coming home for Christmas..This is going to be such a fun panto for all the family!" Paul Harper-Swan, artistic director of Insideout added "We are thrilled to be bringing a panto to the West End this year. I am so thrilled with the cast. Grab a ticket whilst you still can!"